for $229,900 with 3 bedrooms and 1 full bath, 1 half bath. This 1,542 square foot home was built in 1965 on a lot size of 0.275 Acre(s). A CREAMPUFF!!! Location, Location--just minutes to shopping, major highways & Palmer Twp offices & library. 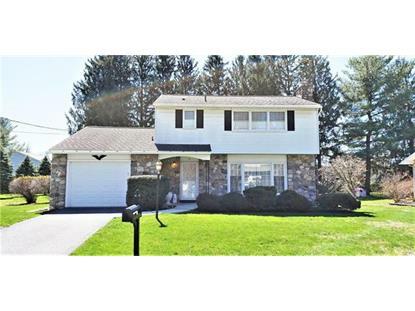 Owners have lovingly maintained this stone and aluminum colonial, nothing to do but move in!! Gleaming hardwood floors in many rooms, stone fireplace in Living Room. Kitchen has flat top range & double ovens, refrigerator also included. Sunken family room adjoins kitchen. Sliding glass door leads to the 16x11 covered patio. Gas grill off patio, connected to natural gas supply. Full & Half Bathrooms have been remodeled. Full bath has garden tub with glass door, split access to the master bedroom. Good size bedrooms, all have ceiling fans w/lights. Economical gas heat, 2 zone. Replacement windows, new hot water heater in 2018. Washer & gas dryer in basement also included. A MUST SEE!! !